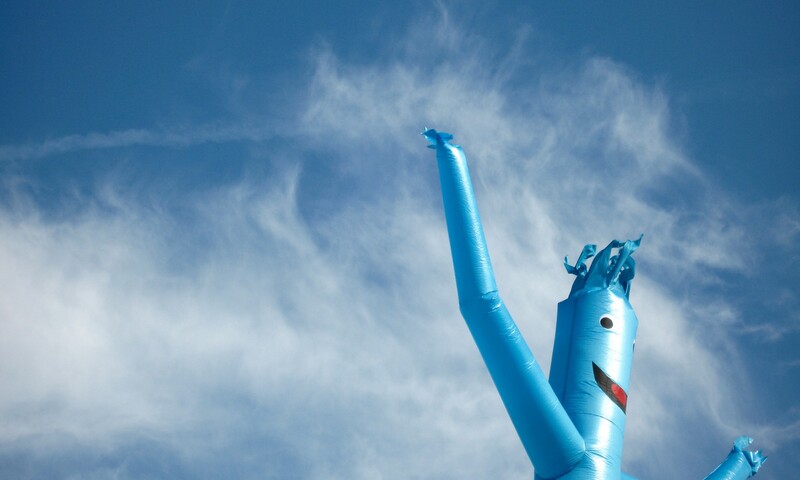 They dance on street corners and used car lots, waving their stubby arms in the wind. Tirelessly they shimmy, collapse, and bob up again, stupid grin permanently glued to their stupid faces. They are wacky inflatable tube guys, a ubiquitous advertising product that manages to be mesmerizing, hilarious, and existentially bleak, depending on your mood. Sitting at a stoplight with nothing else to stare at, it’s easy to watch their erratic performance and wonder: How did something so strange take over our commercial streetscape? To find out, I called a man named Doron Gazit. 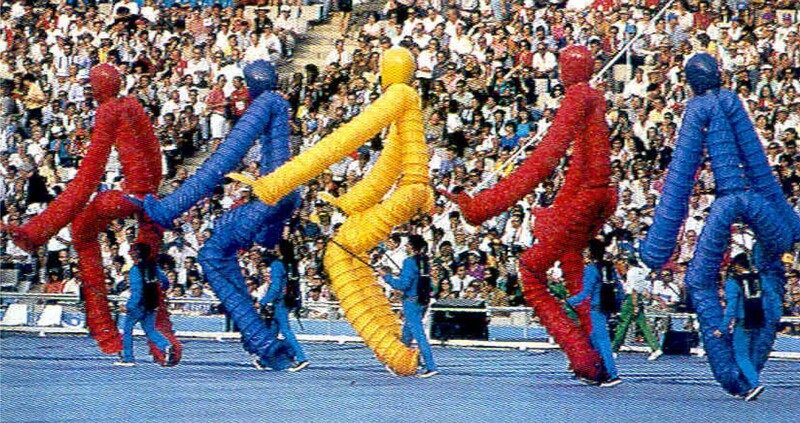 By most accounts (we’ll get to that later), this Israeli artist and inflatables designer is the inventor of the dancing tube guy, which made its debut, improbably, at the 1996 Atlanta Olympics. But when I asked him where the tube guy’s true origins lie, he took me back even further. Photo courtesy of Doron Gazit. While attending industrial design school in Jerusalem in the ‘70s, Gazit had a side gig hawking balloon designs (animals, hats, etc.) on the streets. Around that time he also experienced what he calls a “formative event” when, he claims, he introduced balloons to the Bedouins, whose first encounters with the inflated objects illuminated for him their whimsical, spirited quality. Gazit credits his father, who worked in agriculture, for the inspiration to scale up from his hand-crafted creatures to industrial production. Seeing the plastic-covered greenhouses on his family farm, Gazit was struck by the potential to use these industrial structures for large-format art. He and his father visited a factory where he saw the plastic polytunnels being extruded, and from there he developed his “Airtubes” — 500-foot-long, multicolored inflatables which float, when filled, like lightweight pontoons. 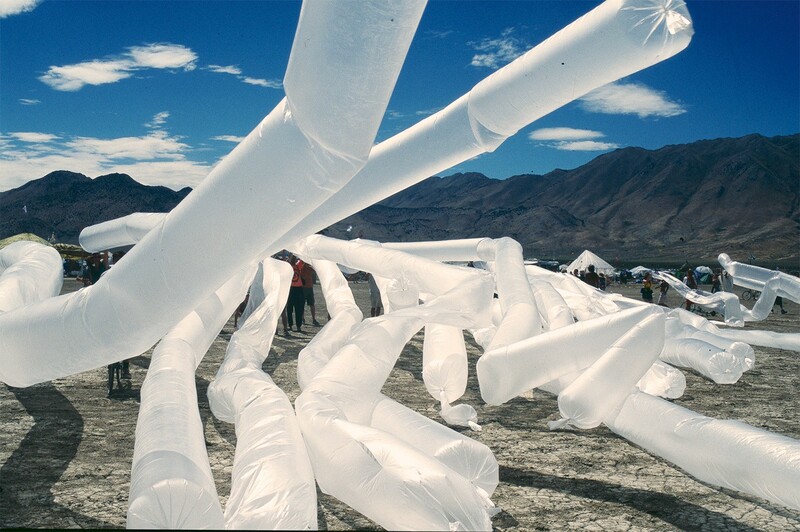 He began using the airtubes as an artistic medium, with the natural landscape as his canvas and the tube as his “three-dimensional line,” citing earth artists like Christo and Andy Goldsworthy as major influences. He strung the airtubes in trees, across desert landscapes, around scaffolding towers, and into the waters of the Dead Sea. This work got him an invitation to show his inflatable sculptures in the ’84 LA Olympics, and he decided to move to LA in the wake of the games. There, he started his commercial inflatable design operation, Air Dimensional Design, Inc., and continued to work not just with closed airtubes, but with open tubes in windy locations that would catch the breeze and dance out over the landscape. Gazit describes this work as “visualizing the invisible,” with the tube only serving as a medium for the air flowing through it. He became an early Burning Man habitué, and continues to go almost every year, happy to take part in the “volcano of creativity” against the backdrop of one of his favorite natural canvases, the desert. “But working with the wind,” Gazit says, “it was always horizontal.” He began thinking about how to capture that same tube-in-the-wind motion, only vertically. The birth of the tube guy was at hand. 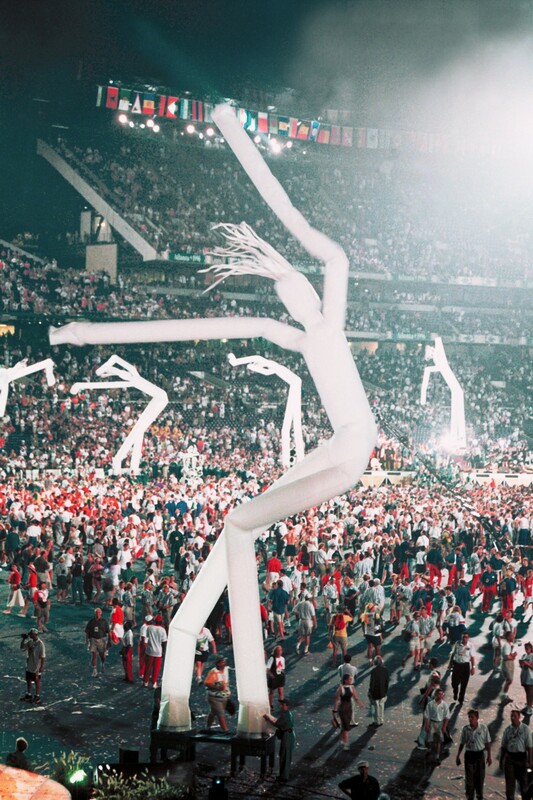 By the time the organizers of the ’96 Olympics in Atlanta got in touch about creating giant dancing inflatable humanoids, Gazit says that he had developed fans powerful enough to project his three-dimensional lines 100 feet into the sky. He consulted with an engineer friend to design a figure that would look like they were dancing, rather than just flopping around. The Fly Guys — Gazit’s name for the two-legged dancing inflatable tube guys — were born, and premiered at the closing ceremony. But these first tube guys didn’t look much like the simple wiggling noodle man that’s since come to dominate America’s used car lots. They were sixty feet tall, with two legs that each had a dedicated fan and a separate articulated torso, arms, and head. These weren’t tube guys. These were full-on tube gods. 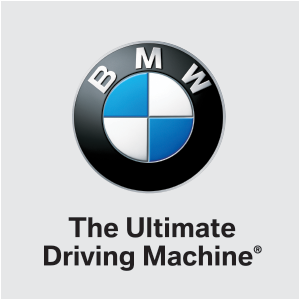 Soon afterwards, the design started popping up at other big events. A company called Tubeworks, started by a man named Drake Diamond (née Austin, Diamond being a nom de tube), supplied a floppy forest of tubes to dance behind Ricky Martin’s Grammy performance in 1998, and both Diamond and Gazit were booked to provide two-legged wacky tube guys to dance along during the finale of the ’98 Superbowl halftime show, a star-studded Motown revue. A clip from the ‘98 Superbowl halftime show. Then the tube guys were everywhere. From the late ‘90s to the early aughts, the figures became wacky inflatable cash cows for the businesses that manufactured, sold, and rented them. I spoke with Colleen Carol, the inflatable party decoration professional who Wikipedia falsely credits with inventing the tube guy, about the early days of the industry. With some basic sewing skills and someone else’s design to copy, anyone could start making their own tube guys and selling or renting them out. Carroll, who followed that copycat recipe to a T to make her first tube guys after seeing them at the Olympics, remembers huge orders coming in during the dot-com heyday, with everyone from Sun Microsystems to Microsoft ordering the new undulating toys by the dozens for lavish Silicon Valley bashes. But even then, these were not the tube guys we know and love. There were the solid-colored, two-legged Fly Guys, like the ones Gazit made for the ’96 Olympics, and there were solid-colored dancing tubes, like the ones behind Ricky Martin at the Grammys. But the single-tubed guys with little arms and dumb smiles hadn’t yet hit the scene. Chris Austin, the son of Drake Diamond and the current CEO of Sky Dancers International (Tubeworks’ successor), remembers the shift to the cartoonish single-tubed dude coming around the turn of the millennium, as inflatables manufacturers started specializing and making individual characters like cowboys, guys in tuxedos, or court jesters for clients. But no one I spoke with in the Inflatable Advertising Dealer’s Association (an organization whose logo includes an artful silhouette of the iconic tube guy) seems to be able to pin down the origin of the standard-model tube guy waggling around the world today. Some good things, it seems, just emerge from the collective wacky inflatable unconscious. The tube guy’s golden era was upon us, but trouble was brewing in the industry. 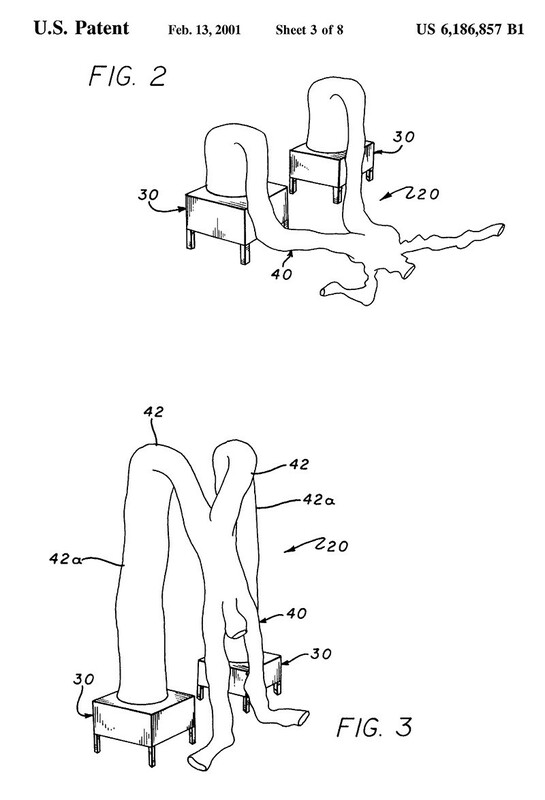 Unbeknownst to his competitors, Gazit had applied for the patent on the tube man, or as the official document calls it, the “Apparatus and Method for Providing Inflated Undulating Figures,” soon after its debut at the ’96 Olympics. Gazit’s application was approved in 2001 (the patent office moves slowly), and he quickly began enforcing his rights, dunning other manufacturers for licensing fees. 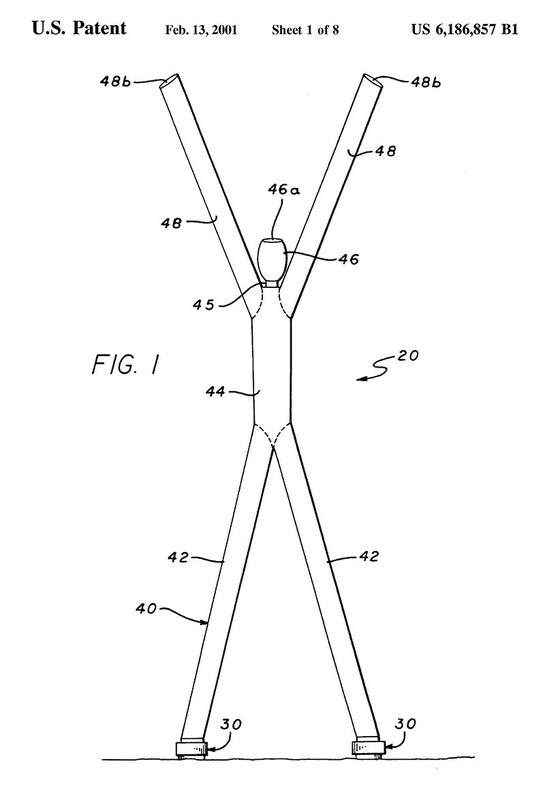 As the patent documents make clear, Gazit’s rights only apply to wacky dancing inflatable figures with two or more outlet holes — in other words, the single torso dancing dudes are exempt, as long as their arms don’t have any outlets — but his move to profit off his many imitators stirred up no small amount of bad blood within the industry. Which is where the tube guy truthers come in. The ’96 Olympic ceremony was, as a whole, designed by a man named Peter Minshall, a renowned Trinidadian Carnival artist who’s something of a superstar in the Carnival parade design world. 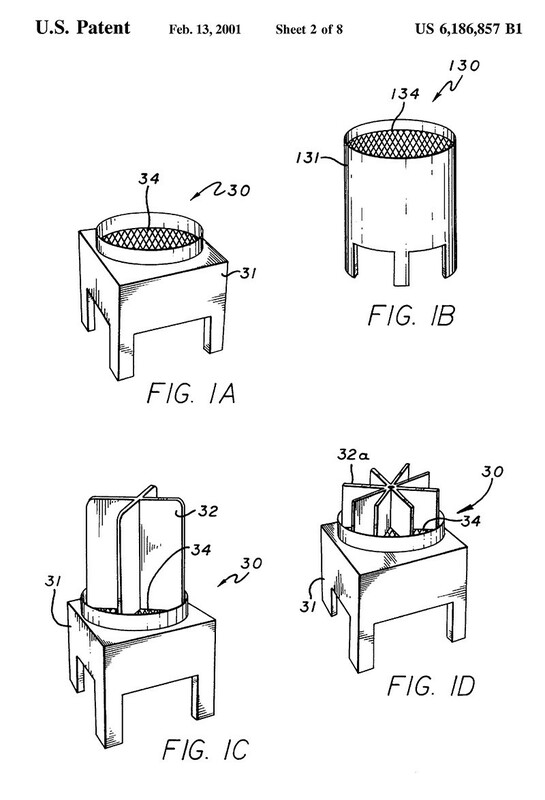 So, the theory goes, it was Minshall who actually designed the original tube guy, while Gazit just built it and, later, patented it. I tried to contact Minshall in Trinidad, and received a reply from Todd Gulick, Minshall’s longtime production manager and collaborator. In short, Gulick claims Minshall came up with the idea, they had no idea Gazit was patenting and profiting off of it, and at one point they almost went to court over it, but ended up deciding it would take too much time and cost too much money. Los Gigantes Olimpicos designed by Peter Minshall, from the segment ¡HOLA!, Opening Ceremony of the Olympic Games in Barcelona, 1992. Courtesy of Peter Minshall. I asked Gazit about Gulick’s claims, and received a respectful if dismissive response. Gazit says that Minshall “had the vision of humanoid dancers,” but Gazit ended up actually making the original tube guys, using his prior expertise with “vertical inflatables.” It was also, Gazit adds, “a great honor” to work with Peter Minshall. More than any patent issues or industry-wide controversy, low aesthetic opinion has presented the greatest threat to this American design icon. Countless municipalities (literally, the Inflatable Advertising Dealer’s Association has no idea what the number is) across the country have banned the tube guy and most other forms of inflatable advertising within their city limits. Houston, perhaps the largest city with such a ban, claims that their use “contributes to urban visual clutter and blight and adversely affects the aesthetic environment” of the city. These bans started popping up in the mid-2000s, but really picked up speed around 2010, after the tube guy had spread to the lots of seemingly every used car dealer in the country. Chris Austin, the CEO of Sky Dancers International, says that the bans, combined with the gradual erosion of the “novelty factor,” has led to a general decline in popularity. Plus, an influx of Chinese-manufactured tube guys around the same time drastically undercut the profits of American manufacturers, forcing them to either adapt or specialize. Austin, for instance, said “the money now is in flags, as far as outdoor advertising goes,” while others have focused on innovation, using new dye techniques to offer better, photorealistic prints on tube guys, or on hyper-specific branded balloons for corporate events. No longer novel, banned across America, and made on the cheap, the outlook for the tube guy might seem grim. But there is still a future for the bravely dancing tube dude, even if it’s no longer meant for human eyes: The tube guy, it turns out, makes a great scarecrow. Dealers and manufacturers say that landfills, farms, and warehouses have been buying up tube guys for years to keep birds away, but one company in particular, Look Our Way, has formalized the tube guy’s transition within the workforce. The company has recently started selling Air Rangers — the same tube guy as always, except with shiny mylar “hair” and “fingers,” and a mean-looking scowl instead of the normal dumb grin. A USDA-funded study at Michigan State and Cornell has been trying to quantify the effectiveness of wacky inflatable scarecrows since 2012, and the anecdotal data from farmers and vintners involved in the study seems promising, though the researchers have yet to release any official results. Nick Kusanovich, sales director at Look Our Way, says that their research has found that Air Rangers work better than traditional anti-bird measures, like giant fake birds of prey or even sporadically exploded firecrackers, precisely because the inflatable tube guys are so wacky. “Other products out there have some repetitive motion that works initially,” Kusanovich said, “but after a while, birds seem to figure out that it’s not really a threat.” The random undulations of the tube guy, however, combined with the noise of the fan, seem to keep birds at bay indefinitely. But why give the Air Ranger an angry face? Are birds more freaked out by giant wiggling tubes that look like they had a bad day? Kusanovich says that they kept the face mostly for the eyes, since some farmers reported partial success controlling bird damage using balloons painted with giant eyes, which theoretically resemble the predatory peepers of a gigantic owl. The mean mouth, though, seems like the last little design touch meant for the Air Ranger’s limited human audience. It might be a far cry from abstract landscape art or the high-concept pomp of the Olympic opening ceremonies, but the tube guy has wackily danced its way back to whence it came — Gazit, remember, was partially inspired to make the original airtubes by his father’s plastic-tunnel greenhouses, growing up in Israel. On its way from greenhouse wall to next-gen scarecrow, though, the tube guy picked up some tricks of the entertainment trade. 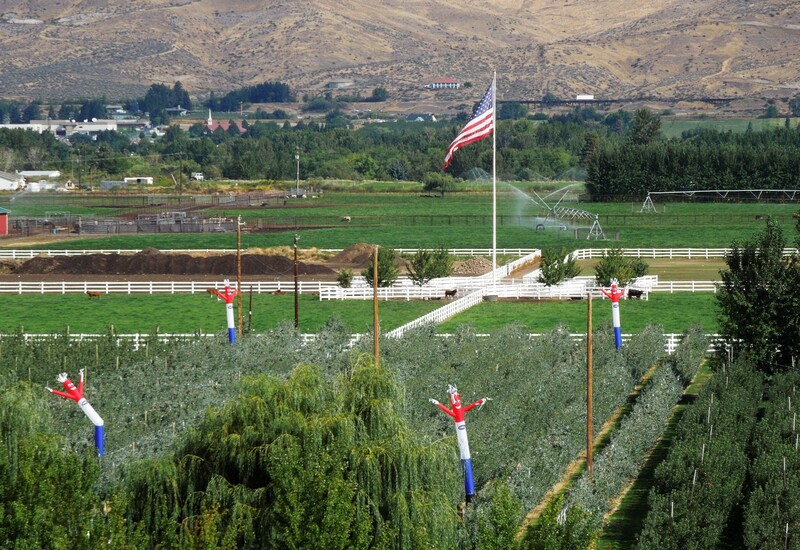 Look Our Way has a video of an Air Ranger installation in a berry field up on its website that might as well be an art project, or an SNL short, the camera silently closing in on a single tube guy, his face contorted in rage, as he and his brothers dance alone in the countryside. It’s meant as an ad for the product, but like most videos of the tube guys, it is mysteriously hilarious.